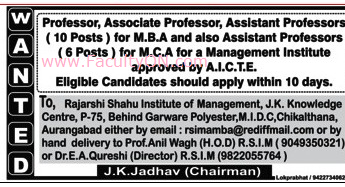 Rajarshi Shahu Institute of Management, Aurangabad has advertised in the LOKMAT newspaper for recruitment of Teaching Faculty- Professor / Associate Professor / Assistant Professor jobs vacancies. Interested and eligible job aspirants are requested to apply within 10 days from 19th Sept 2018. Check out further more details below. About College: BGPS' Rajashri Shahu Institute of Management was established in 1997. It trains students for Master of Business Administration of Dr. Babasaheb Ambedkar Marathwada University and is recognized by A.I.C.T.E. Govt. of India and Govt. of Maharashtra. It is well equipped with state of art computer lab. The latest teaching aids and library to support the able and experienced teaching faculty. Professional practioners and managers from well known companies engage classes and share their experience with the students. Many well established industries in Aurangabad as well as outside Aurangabad Contribute to the training program. How to Apply: Interested and eligible candidates are requested to send CV along with copies of certificates and PP size photos to the college address in hand or to the email address given below.